Earn more with value added services that integrate with your business. Simple, fast, hassle free bill payments. Now you can earn more by offering your customers to pay their utility bills using ePaisa VAS services effortlessly. A complete money transfer solution your customers can use to securely and conveniently send money to loved ones worldwide. First time in India! Let international travelers and Indians recharge their prepaid foreign mobile phones at your outlet with the ePaisa app instantly. All the tools that help you build your business in one app. Sign up and create an ePaisa account to get started. Our services are aimed at the discerning traveller visiting Delhi and North India for Business & Leisure. Earlier we were limited to only accepting cash, and we lost out on many customers who preferred to pay by card. With the ePaisa card reader that travels well, our customers without cash can now ride conveniently. 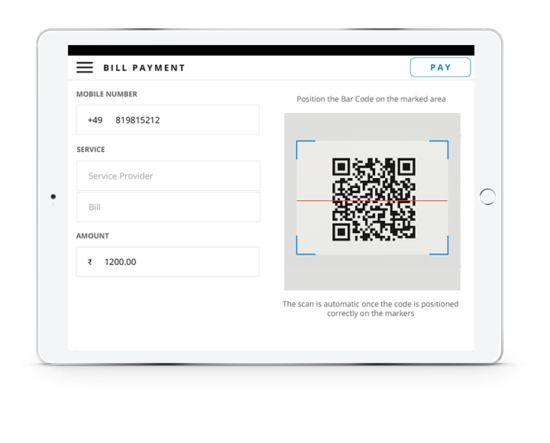 We can send out customized promotions and digital receipts right from the ePaisa app. It has not only helped simplify our driving operations but has also improved our billing system & customer management. I own a retail store and have limited storage space. It becomes difficult to determine when I am out of my best selling item and I have to see my unhappy customers walk away. ePaisa helped me keep track of my inventory and now I can reorder my best selling item ahead of time and never run out. My customers are happy and I am happy too. We at Hindustan Wellness, offer a wide range of preventive heath check up plans to people by collecting their samples from and delivering them at their doorstep. To accept payments, we needed a fully integrated solution which will help us accept card payments and also keep everything in check. ePaisa helped us keep track of our supplies and made it easier to analyze our daily transactions. I use the reporting and analytics feature to optimize my business and review the Top Items to figure out which items to feature more prominently on my online store. The real-time sales numbers from the dashboard help me to check in and make sure everything is going smoothly. Accessing your commission earned with ePaisa is free. Create an ePaisa account or sign in to your dashboard to get started. Retailers all over India use ePaisa. Simplify your retail operations with everything from mobile point-of-sale tools and billing to inventory management and next-business-day deposits. Sell in person and on-the-go with ePaisa. Restaurants all over India serve with ePaisa. No matter how your customers order—at the counter or on-the-go, ePaisa gets you payment ready. Put the finishing touches to your business and keep the important stuff organized with ePaisa inventory management and back-office tools. Wellness professionals across the country are using ePaisa to reduce labor costs, improve staff productivity, and allow staff to provide more personal service. Taxi services are driving up their sales with ePaisa. Accept credit cards and run your driving service from a smartphone or tablet. ePaisa simplifies your operations with everything from card transactions to next-business-day deposits. Whether you’re selling movie or concert tickets, ePaisa is the perfect leisure and entertainment point of sale, that lets you sell at the venue or in person. Trusted by service professionals all over India. ePaisa provides flexible tools to manage your whole business. Whether you provide services on the go or in an office. Banks across India work with ePaisa. Meet all businesses demands. Enhance your product offering to acquire new customers and re-engage existing ones.